More trouble for our trees? Did you lose trees to Dutch Elm Disease? How about the Emerald Ash Borer? What we don’t need is another disease that wipes out our trees — especially in the Urban Forest where a very high percentage of the trees planted in most cities may be some form of Maple. If you noticed black spots on the leaves of your Maple this year, you’re not alone. Fortunately, although the black spots are unsightly, they’re probably not a harbinger of yet another disaster-in-the-making for our tree population. However, it is something you should address! For more information about caring for your Maples, follow this link and read the article by Jill Nadeau of Wisconsin Public Radio. Tulip lovers stretch the season by planting lots of different species and cultivars. Though each only blooms for a short time, the tulip parade can last two full months if you plan it carefully. 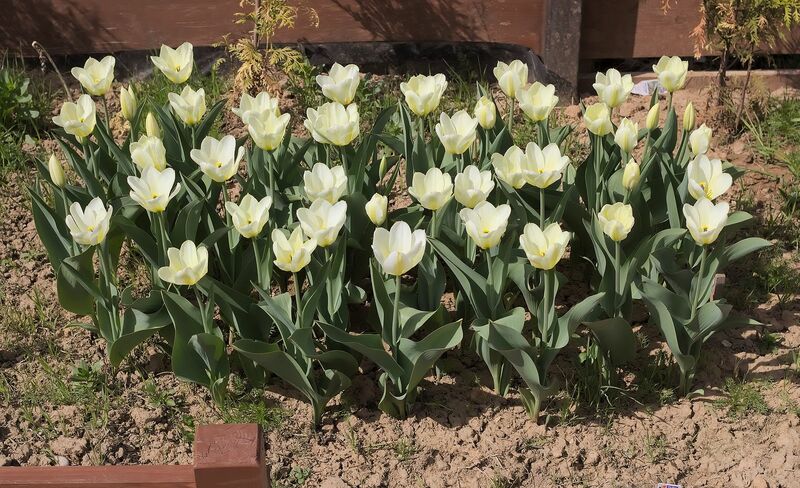 Early: The first tulips are low to the ground, including the wide-leafed Kaufmannianas, sometimes called water-lily tulips because of the shape of the flowers, and Gregii’s, known for their mottled leaves. 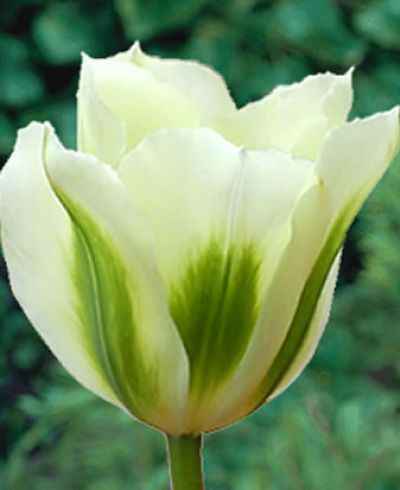 Soon after them come Emperor, aka Fosteriana, tulips, the earliest of the long-stemmed types; Single Early, which is usually slightly taller than Emporor; and Double Early, ditto. Mid Season: Once the days lengthen and weather warms up, you’ll get Triumphs, first of the truly long-stemmed florist’s types, which come in a wider range of colors than the early birds. Also Peony-flowered tulips, known for their lush doubleness; and Giant Darwin, the florist’s tulip on steroids. Late: This is the season for Darwin tulips, also known as Single Late, the classic tall-stemmed cups of color that first come to mind when you hear the word tulip. It’s also the time for exotica: huge Parrot tulips, with their twisted and ruffled petals; urn-shaped Lily-flowered tulips; Viridifloras, with flames of green rising up the outside of the brightly colored flowers; and Fringed tulips, sometimes listed as Tulipa crispa, their petal edges frilled with narrow teeth that glow when the light shines through. Species: There are dozens of species tulips available, primarily through mail order. Smaller and more delicate than garden tulips, they are mostly mid-season bloomers, with a few earlies, such as the tiny white T. biflora, and a few members of the late show, such as the bright red T. wilsoniana (T. montana). The available array keeps growing, so it is best to buy from a purveyor who is clear about blooming time in the catalog. or your pruners? There is a difference between pruning and shearing. 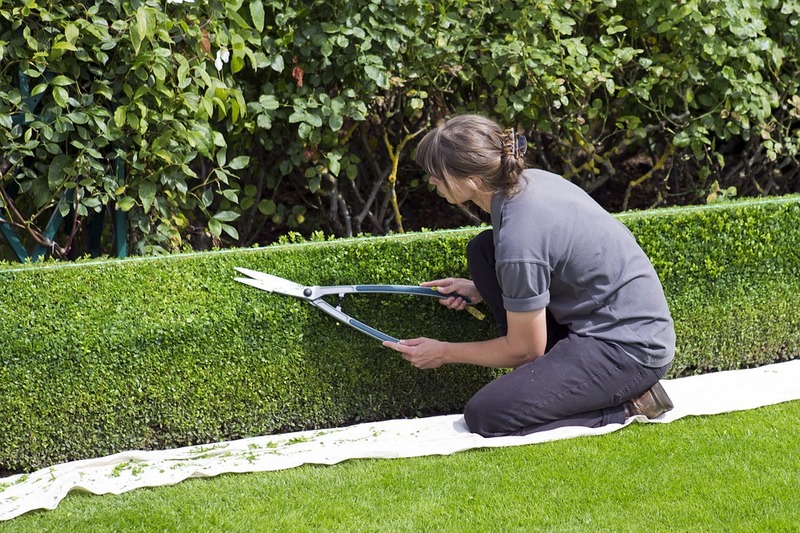 Pruning means cutting off a part of a living plant, and covers everything from snipping a twig to reaching deep inside a tree canopy and sawing off a major branch. Shearing is a particular kind of pruning, one in which only branch tips are cut, and they are cut as a group rather than individually. The goal of shearing is to force lots of small outer branches while creating a smooth outline. The result — if it is successful — is that the sheared plant loses it’s natural identity and becomes a formal shape. 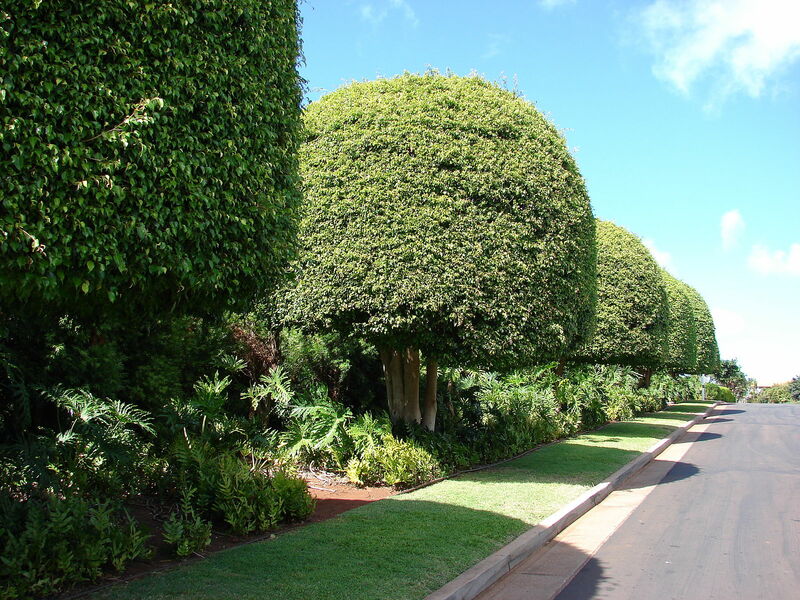 The most common example of the technique is the flat-faced wall of a sheared hedge, but people also shear plants into mounds, pyramids, graduated balls on sticks, or (in a few extreme cases) things like chess pieces and leaping dogs. Shearing at the simple hedge level seems as thought it should be easy; just hold the shears at the proper angle and clip away. In fact, it takes patience, practice — and strong arms — to see where you need to cut and then do the cutting properly. Electric hedge trimmers promise to relieve you of much of the work, and they do make it go faster. But they are heavier than hand shears, their speed increases the chance of mistakes, and they have a regrettable tendency to tear everything they touch instead of cutting cleanly. The ubiquitous Kalanchoe (pronounced kal-an-KO-ee) is at almost every grocery store that has a floral department, and getting one as part of a get-well or birthday celebration is as common as getting a card! However, the plants are always blooming beautifully upon receipt, but when the blooms begin to fade the plant tends to look straggly and is often discarded. Not necessary! There is nothing quite like coming in from a bitter winter’s day and seeing the mass of bright red flowers. Even the variations on red that are available — the softer apricot, deeper magenta, or singular yellow — brighten both the room and your soul. Compact, bushy, and about a foot tall, kalanchoe is common in winter, but once the flowers disappear, many people abandon them. That’s a shame, because with very little effort, they can be forced to bloom whenever you want. Kalanchoe is what is known as a short-day plant, but it is really the length of the night that matters. For kalanchoe to set flower buds, it needs six to eight weeks of days with 14 to 16 hours of uninterrupted darkness. And uninterrupted means exactly that, so you’ll have to put it in the closet every afternoon — over in the corner where your poinsettia spends the fall, as it needs the same treatment. Pick the right closet because anything in it you might need won’t be available until morning. About a month after the dark period ends, color should be showing as the buds begin to break. Other than that, kalanchoe is a cinch to grow when given lots of sun (except when it’s in the closet). It thrives in warmth, 65ºF or more, although it tolerates temperatures just above freezing. It should have the chance to go a bit dry between waterings, and it likes a general fertilizer every two or three weeks when new leaves are growing. When it gets too big it can be cut back pretty hard, leaving only three leaves on each branch. If you do cut it back, wait until it has at least three pairs of new leaves on each branch (about two to three months) before tossing it back in the closet to initiate flowering. Once the days are short and cold, you can’t expect kale to keep growing. But you can help it survive almost indefinitely. The trick, which also works for Swiss chard and other hardy greens, is to keep the soil around the roots from freezing. Start by applying a thick blanket of organic mulch — straw or shredded leaves. That will be enough if you are in zone 7 or the warmer parts of zone 6. If it’s colder, use bales of straw and old windows (or clear plastic) to build a lean-to cold frame. Place a row of bales close to the long side of the kale row. They should be to the north if the row runs east-west, to the east if it runs north-south. Put another row on top so you have a wall about 3 feet high. On each short side, make a sloping wall by butting single bales firmly against the back wall, then topping them with partial bales. Now use the windows (or clear plastic sheeting) to cover the front, making sure the cover does not touch the plants. At the top, windows can just lean against the straw. Plastic should be draped and held in place on top of the bales by rocks or a heavy board. At the bottom, where the cover touches the ground, mound on a few inches of soil to hold it and seal out drafts. At this point, you should have a structure whose sloping, clear roof faces south or west. Use loose straw to fill in any gaps in the walls. That’s it. Throw a heavy blanket over the cover when night temperatures are predicted to fall below 20ºF; and open the frame at the top on warm, sunny days or you’ll cook your kale before you bring it indoors. Don’t try this with root crops; mice and voles will colonize the bales of straw if you feed them beets and carrots! Do you love plants that have tender bulbs but think it is too much trouble to store them over winter? Hang on folks. The results may be worth your efforts and this is a great way to increase your supply. The directions are for plants I have been successful in storing. Remember to dig carefully. It is important to loosen the roots gently, digging a few inches away from the plant. You want to avoid cutting or breaking the fleshy structure. Diseases enter through cuts and bruises. A gladiolus “bulb” is really a corm, a swollen underground stem. A new corm forms on top of the old one. While this is taking place, small new cormels are produced from the base. Corms can be dug when the foliage begins to yellow or before a hard freeze. After carefully digging the corms, cut off the old leaves close to the corm. Leave the corms outside in the sun for a day or two and then spread out in a garage or similar place to cure, but not on a cement floor. This will prevent storage rot. After a few weeks of drying, clean them by removing the roots and outer sheath of corm. Remove and discard the old corm. Store the corms in a mesh bag and hang them out of the way in a cool well-ventilated area. I use a mesh onion bag and hang it in my basement. The small cormels can also be saved and planted the following year, but it will take a few years to produce blooming plants. Dig the rhizomes in fall before the first frost. Remove the old stalks and gently brush off soil. They can be washed with a garden hose. Let them dry for a few days before storing. I store my rhizomes in a box filled with vermiculite. However they can also be stored in peat moss. Another way to store cannas is to leave the soil on the rhizomes and pile the clumps in a box. Cover with plastic and store in the basement or other dark, cool, dry area. I put the box on top of another container to keep it off the cement floor. Rhizomes must not freeze during storage. The temperature should be between 50 and 60 degrees. Never store canna rhizomes in a mesh bag, as this will allow the bulbs to dry out. Bulbs should be lifted out of the soil in late fall, but before the first frost. The bulbs bruise, so handle them carefully. Remove the excess soil by either washing or carefully rubbing it off. Dry the bulbs away from direct sunlight or wind for several days. Put them in a paper bag and store them in your basement or other dark, dry location. Like cannas, the temperature should be between 50 and 60 degrees. When storing, I label the containers carefully. You can use a permanent felt marking pen to write directly on the fleshy root. I find it helpful to attach a sheet of information regarding planting time, depth, etc. to the container. During the storage season, I periodically check for damaged or rotting material. Any damaged material is removed and thrown away. You don’t want one bad “apple” to spoil the whole bunch. Once spring arrives, you will be glad you saved those tender bulbs. If you have more corms, rhizomes and bulbs than you can use, think of your fellow gardeners and give them away.